When taking in the beauty of Horseshoe Bay Beach, you should travel there by the most convenient way possible, by scooter, moped or pedal bike. Telephone the No 1 scooter rental company in Bermuda on +1. (441).296.2300 to hire your easy to handle vehicle, be it an electric bike, rental scooter (moped) or pedal bike (or book your scooter or bike hire online for a 10% discount!). Bermuda welcomes a great many cruise ships annually, bringing thousands of holiday makers to its shores. They are all set to take a tour and experience the exciting attractions of Bermuda. 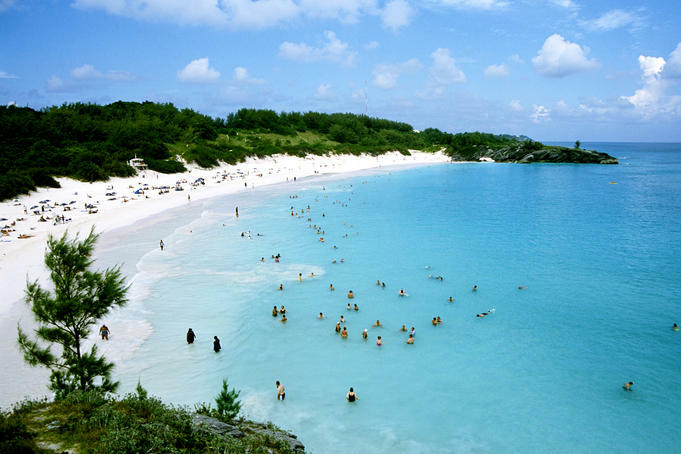 The most visited tourist spot on the island, however, is said to be the beautiful Horseshoe Bay Beach. It attracts more visitors than any other destination, and its little wonder why. It truly is a wonder to behold! When travelling to Bermuda, many people come to beautiful Horseshoe Bay Beach, in Southampton Parish. It is one of the most popular tourist attractions on the island. The spot is known for its striking pink sand and crystal clear blue waters. It is among the most famous and frequented visited beaches in Bermuda. This makes Horseshoe Bay Beach an essential places to visit while on holiday. The bay is located on the southern coast of the island, looking on to the Atlantic Ocean. It is to be found on South Road. Horseshoe Bay Beach has been called one of the finest beaches in the world. It is a popular tourist destination for the entire family, both young and old alike. It is moreover a fine locale to take a weekend break or a romantic holiday. For instance; is said many couples often fly to Bermuda for a Valentine’s vacation. Horseshoe Bay is visited by thousands of people every year. It is famous for its extensive curved beach and stunning ocean views. The bay gets its name from the fact its shape somewhat resembles a horseshoe. The beach is bordered by huge cliffs and rocks made of limestone. The main public beach makes up a distance of around 1,320 feet, which is the equivalent of a quarter of a mile. The bay moreover extends out to approximately four miles in an easterly direction. Here’s a recent video (September 2011) detailing a typical scooter ride from Kings Wharf in Bermuda to Horseshoe Bay Beach. Take a few moments and take in the breathtaking experience that is scooter travel in Bermuda! People travel from all over the world to stroll on its distinctive pink sand, which is soft and does not get so warm that is hard to walk on. The sand is apparently made up of minuscule pieces of shell dust and coral, which stops it from getting too hot. This is also thought to be what gives the sand its distinctive pink colouring. Visitors furthermore come to Horseshoe Bay for its blue turquoise waters and crashing waves. It is little wonder people from across the globe consider this stretch of beach the perfect holiday paradise. Horseshoe Bay is the ideal place to go beach combing, sunbathing, swimming and engage in water sports. It is just right for diving, scuba diving or snorkeling. Tourists can moreover try sailing, jet skiing or water skiing. People often swim in the shallow waters and explore the coral reefs. There are many exciting underwater caves and shipwrecks to visit. There are also many wonderful coves, such as Peel Rock Cove and Port Royal Cove, often referred to as Baby Beach. This is a popular spot with families, where children like to go swim. You could furthermore venture to Daniel’s Head Beach Park or Somerset Long Bay. There is also the covered Longwood Cove or the isolated Astwood Cove. The area is famous for its picturesque walks and trail ways, taking in its beautiful scenery. Tourists can also take a walk to the beaches at Chaplin Bay. If you are interested in local marine life, there are many intriguing species of fish to study, examine or look upon. The waters are home to such varieties as angel fish, wrasse, snappers, sergeant majors and parrot fish, among others. Tourists should be aware the ocean waters can rise to considerable levels. This is why there are lifeguards on duty at certain times of year, to keep a look out when the waters get high. Horseshoe Bay Beach is believed to have the largest choice of facilities of all the beaches in Bermuda. It is not uncommon for visitors to Horseshoe Bay to avail themselves of the local amenities, for purchasing essentials, like snack foods, at the Beach House. Horseshoe Bay Beach also has a rental stand where you can hire out snorkeling and water skiing gear. This is alongside beach chairs, deck chairs, loungers or umbrellas for sitting on the beach. The beach area additionally has restroom and changing amenities. It also has a feet washing facility where you can clean off the sand before leaving. There is also a shuttle bus laid on, to transport tourists from the beach to the nearest bus stop. There are a wide range of souvenir gift shops where you can pick up a memento of your stay, or find the right bargain. The beach is famous for its numerous activities. It is the perfect place to walk on the seashore or go jogging. The beach is also recognized for the various sporting events. They range from a volleyball competition which takes place in the summer months, on a weekly basis, as well as having soccer on the beach. It is also a busy spot for tourists travelling to Bermuda on cruise ships. There is a vast array of exciting events held on the beach all year round. They can be enjoyed by tourists and residents alike. These include the annual Bermuda Kite Festival which takes place every Easter, on Good Friday. The skies are filled with many different kites, made by all kinds of people. It is a fun event for the whole family. The festival is complete with a prize giving, where people can win in various categories. The beach also holds an incredible Sand Sculpture Competition. It generally takes place at the close of August. This is where sculptors and designers from Bermuda and overseas compete to create the finest, most detailed sculptures on the beach. They can also win in a number of categories. The contest is brought to you by the Architects Association of Bermuda. Horseshoe Bay Beach additionally holds the biggest beach party in Bermuda. It is called Beachfest and is an island emancipation celebration which makes up an important part of Cup Match. It is held every year, in the summertime. This is the island’s annual two day public holiday, where people take part in a variety of sporting events, such as boating, swimming, camping and cricket. Tourists could have something to eat or drink at one of the various vendors and concession stands nearby. The Bay is furthermore renowned for its amazing New Years Eve celebration, often put on by island residents who were originally from the UK. Wednesday night is Harbour Night in Hamilton City, close to Horseshoe Bay. This is the night of the week where shops, bars and restaurants stay open till late, providing live music and entertainment. If you want to go out dining by Horseshoe Bay Beach, then there are many fine eateries in the area. Travellers could stop for a hot dog or burger when visiting the Horseshoe Bay Beach Café. There is also an Italian restaurant close by, on South Road, called Tio Pepe. This is the place where you could sit down and have lunch or leave with a packed meal, before setting off on the next stage of your journey. There are many fantastic excursions leaving from Horseshoe Bay. There are also other gorgeous beaches in the vicinity. Warwick Long Bay Beach, in Warwick Parish, is an extensive body of sand located on South Shore Park. It goes on for about half a mile. It has pink sand with low grass and trees made of cedar and grape. Horseshoe Bay Beach is moreover close to beautiful Marley Beach and Elbow Beach, with its amazing resort. People can also go snorkeling at Church Bay. Horseshoe Bay Beach is furthermore a stone’s throw away from many hotels and holiday resorts. You can then walk to the beach and enjoy their various facilities. They have restaurants, bars, swimming pools, tennis courts, golf courses and more. Many holidaymakers stay at the Fairmont Southampton, The Reefs Hotel and Club and the Wharf Executive Suites. This is along with residing at the Bermuda Paradise Vacation Villa Bed and Breakfast and the Surf Side Beach Club, to name but a few. If you feel like a round of golf, the Port Royal Golf Club and the Newstead Belmont Hills Golf Resort & Spa are a short distance away from Horseshoe Bay Beach. It is also close to local landmarks like the Gibbs Hill Lighthouse. There are many shops and department stores nearby if you enjoy shopping. They are to be found in Front Street in Hamilton City, Kings Square and the Clock Tower Mall at the Royal Naval Dockyard. If you wish to spend an evening out by Horseshoe Bay Beach, there are various pubs and restaurants in the area, or within accessible distance. They range from Fresco’s Wine Bar and Restaurant in Hamilton City, The Pickled Onion, Henry VIII Restaurant and Bar and the Docksiders Pub & Restaurant. You could also dance the night away at Light Nightclub and LV’s Piano and Jazz Lounge. This is just an idea of the many wonderful things to see and do at Horseshoe Bay Beach in Southampton Parish, Bermuda. There is a whole lot more to it than just spending a day at the beach. Why don’t you come out and see for yourself? A Beach To Definitely Visit! Horseshoe Bay Bermuda – One of the World’s top beaches! Bermuda is lucky to have many of the world’s most beautiful beaches, reputed for the pink sand that covers them and the clear blue of the ocean. The most famous of them all is certainly the Horseshoe Bay Beach, in the parish of Southampton. As its name suggests, the beach is shaped like a horseshoe and stretches to about 4 miles long. The most southern beach in Bermuda, the Horseshoe Bay Beach is also public and the most popular. When cruise ships offload tourists by thousands, the first quarter of a mile can get overcrowded, and you are better off at the western end of the beach if you fancy a bit of quiet time. Whether you are into snorkelling, swimming or sunbathing, Horseshoe Bay is the ideal beach for you. The sand is fine, soft and of pale pink colour, the water is quiet and crystal-clear blue, and the beach is surrounded by limestone rocks that offer a great base to snorkellers. Be aware though that behind its quiet appearance, the water can sometimes be dangerous, especially because of rip currents. But fear not, there are lifeguards on duty from May to the end of October when the tourist season is at its peak. Located at the end of Horseshoe Road, off the South Road, the beach is accessible by bus (there is a stop just at the entrance) and there is a large car park for cars and scooters at the end of the road. It has great facilities, adding to its popularity. At the Horseshoe Bay Beach House, you can find cold drinks, different types of food, ice-cream and refreshments. Beach equipments (chairs, umbrellas, towels, suncream, hats…) as well as snorkelling gear can be rented at a concession on the beach too. Showers and toilets facilities are available too. If you are in Bermuda in August, don’t miss the sand sculpture competition organised by the Architects Association on the beach. There is also a kite competition held each year on Good Friday open to anyone. Once you have been to the Horseshoe Bay Beach, it is not a surprise that it has been rated as one of the world’s top ten beaches by the Travel Channel, as well as a favourite Valentine’s day getaway by USA Today. It really is a breathtaking location and the first choice of many local residents too. Horseshoe Bay Beach in Southampton Parish – Rent a scooter, moped or bike from Elbow Beach Cycles and get a massive 10% off your scooter if you book online NOW. AND, if you book early enough and pre-pay your scooter hire, you’ll get a 15% discount!! Part of Elbow Beach Cycles’ Things To Do in Bermuda series!